Howling Hill Farm was founded in 2013 by Dr. Kitt Hollister and Neal Kennedy. We began with Scottish Highland Cattle, but knew from the start that our focus was to be on a smaller livestock species -- either goats, sheep, or possibly alpacas. We obtained our first two pet females in the fall of 2013, and knew right away that the alpacas were "our" species. The cows left in 2015, and we haven't looked back. While we did eventually add sheep to our farm, the alpacas remain our core focus, and we are now proud to host a herd of 150+ foundation females, herdsires, and cria. I knew from the start that the grey alpacas were to be our primary focus, and I have always loved all three "grey" phenotypes -- tuxedo, roan, and harlequin. 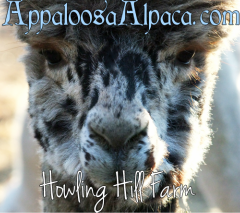 Initially, the harlequins seemed like a distant dream, and so it is that much more exciting to me that we are now well on our way to becoming one of the premier Harlequin Appaloosa alpaca breeding farms in the United States.